As extreme sports grow almost as fast as technology, so does the injury rate. Not only are people pushing their limits physically, they are choosing locations even farther away from help should they need it. 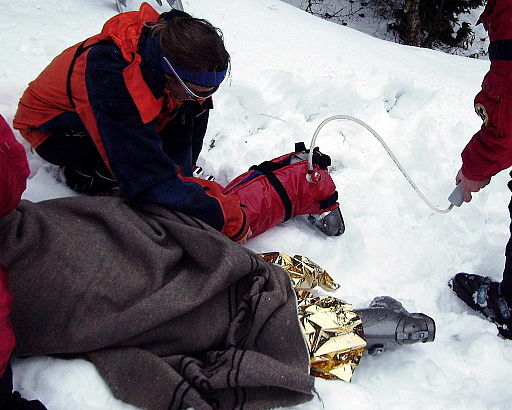 While most injuries are minor, some are life-threatening. If you break a leg, you’re not walking anywhere unless you know how to properly treat the break. Common sense and a little imagination goes a long way in an emergency. When it comes to broken bones, I’ve seen some pretty creative techniques (even created a few myself) that worked until the victim could get to the hospital. The bottom line is that the break needs to be immobilized by a splint. Nature offers all the materials you need. You provide the creativity. There are two types of breaks (fractures), open and closed. When you’re dealing with an open (compound fracture), you need to be more concerned because of blood loss. Either break requires minimal manipulation to avoid further injury. Be very careful while moving the victim. Treat the bleeding first by washing it, removing debris and covering it with sterile pads. DO NOT APPLY PRESSURE! If the bleeding becomes life threatening, a tourniquet may be necessary. Here’s the common sense part: If you’re close to civilization and have a signal, call for help. If the victim can walk out, then walk out. If you’re out in the boonies with no help around, you need to make a plan. First and foremost, the victim needs to be as comfortable as possible and out of immediate danger. Shock can kill and you want to take all precautions against it. The break needs to be splinted to avoid further injury. The splint should be sturdy enough to prevent movement but not too tight as to cut off circulation. If it’s a leg break, the splint should immobilize the whole leg. Look for good branches and tie it off with whatever you have (bandanas, paracord, clothing cut into strips or tape). Monitor the victim constantly. Often the break will require traction and this can be challenging. If you’re out in the middle of nowhere with no help around, you may have to reset the bone as best you can. Usually the victim will have a sense of what they need to ease the pain. Gently pulling away from the break and moving the limb back to a normal position usually relieves much of the pain. Be very careful while doing this and do it only when you have no other choice other than self-rescue. In a leg break, sometimes you’ll need to maintain traction. Make your splint extends past the foot enough so that you can fashion a twist-type apparatus that maintains a constant pull away from the area of the break. Once again, creativity and common sense go a long way and your victim can help you provide the right tension. The bottom line is that you want to get the victim to help as quickly and painlessly as possible. Remain calm and keep assuring the victim that he’ll be alright. Depending on your situation, you may have to make major decisions that could be deadly. Keeping a cool head and being prepared often make the difference between life and death. Before you head out on your next adventure, make sure you prepare for and are knowledgeable about dealing with worst case scenarios. Tools and first aid kits are useless unless you know how to use them. Survivors always practice!